It’s not often that a sophomore can earn a starting spot on the offensive line for the best team in the league, and it’s even more rare that the sophomore can dominate like Ryan Clemente did last season. While he was a sophomore in age, his size and strength allowed him to fit right in alongside juniors and seniors, opening up holes for Nick Rajotte (14 touchdowns) and protecting quarterback Chad Peterson (22 touchdowns). In one-on-one situations, its unlikely anyone is going to push the tackle back but maybe most impressive is the 265-pounder’s ability to pull off the line and make a block up field. North Attleboro has a new group of backs this season but don’t be surprised if they have success early on running behind Clemente. Ferreira broke out during his sophomore season and last year proved that he is one of the top receivers in the league. He nearly set a new single-season reception record with 53 catches in 2016 and totaled 833 receiving yards (15.7 per catch) and caught six touchdowns. Despite regularly seeing double teams and having defenses key on him, Ferreira was able to use his strength to get past defensive backs on the line and improved route-running to get open. With strong hands and the size to beat most defensive backs to any ball in the air, Ferreira is a consistent weapon for the Hornets’ passing game. There is no secret that KP is a team that likes to keep the ball on the ground and the Div. 1A Super Bowl champions will lean heavily on Frommer as the lead back this fall. The Yale-commit emerged last year as the go-to running back and put up impressive numbers behind a strong and experienced offensive line. He rushed for 1,100 yards, averaging 6.8 yards per carry and scored nine touchdowns. He also made nine catches for 127 yards and a touchdown and returned a punt for a score as well. Frommer has good vision to find the hole and the burst of speed to take advantage of the space. As one of only two returning players on offense for KP, expect Frommer to see a lot of action this fall. 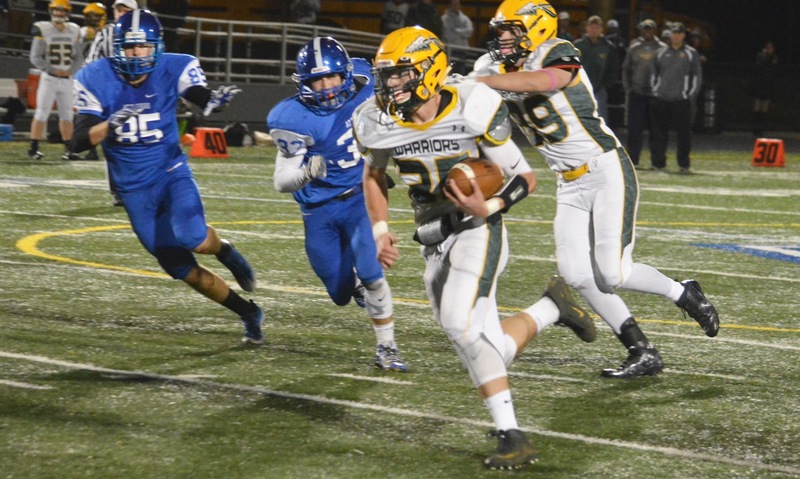 An injury to the starting quarterback gave Furtado the opportunity to show off his skills as a sophomore, helping Attleboro to a strong closing stretch in 2015. Last season, he was used more as a running back, although he did have moments under center running a ‘Wildcat’ set. Furtado has speed to get to the outside, but also the strength to take the ball up the middle. He can make people miss and break tackles, but this year the Bombardiers will also need him to show that he can make plays with his arm too. If Furtado can develop his all-around game at quarterback, then the Attleboro offense could be one of the best in the Hockomock League. 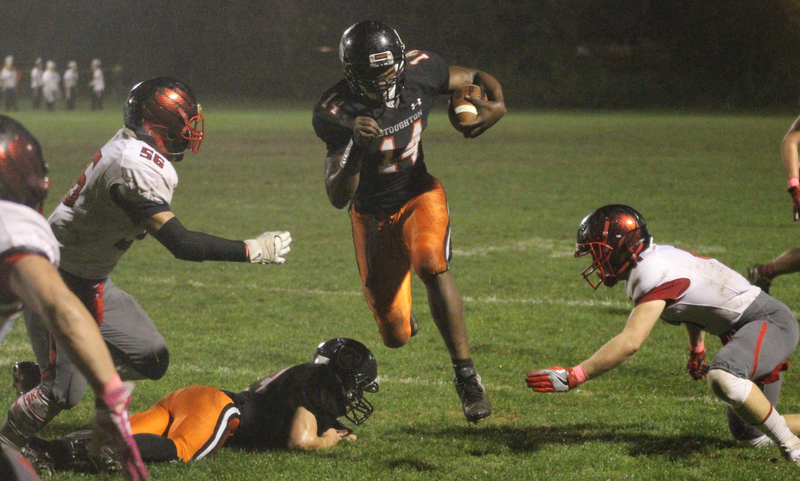 Once Gibb made his debut in week three of last season, he looked right at home as the starting quarterback for the Black Knights. Last season, Gibb tossed for eight touchdowns and rushed for two more. 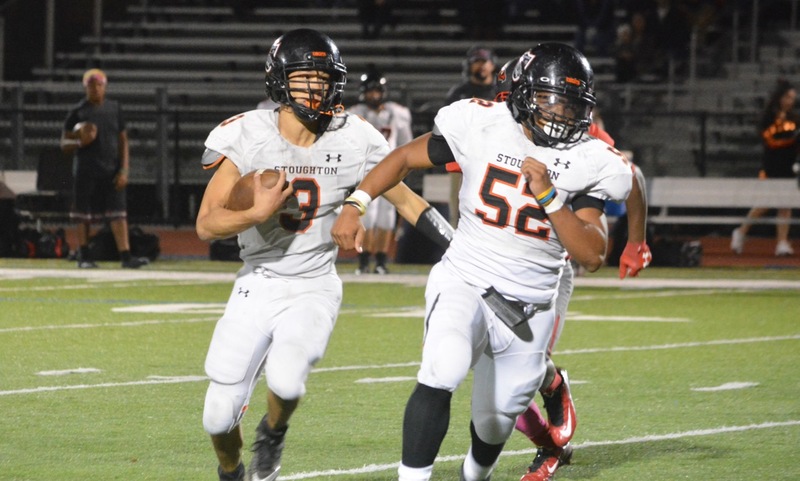 Now with nearly a season of experience under his belt, Gibb will be a leader on the offensive side of the ball for Stoughton. Although he will be without two of his top weapons from last year – Ryan Sullivan and Izon Swain-Price – he showed the ability to make plays on his own. He showed the poised to sit in the pocket and fire downfield to receivers and also showed glimpses of being able to get out of the pocket and make a play with his legs. There will be a lot of new faces on the offensive side of the ball for the Bulldogs this season, but one familiar face will be Tony Harris. And in all likelihood, Harris will be a focal point of the offense. Standing at 6’4, and with two years of playing experience under his belt, Harris is one of the most experienced and talented receiving options in the Hock. He will have sophomore quarterback Johnny Hagan starting under center this year so it will be interesting to see how quickly the two develop chemistry in games. Even if Harris isn’t going out to catch a pass, it’s very possible he could see some handoffs like he did a season ago. 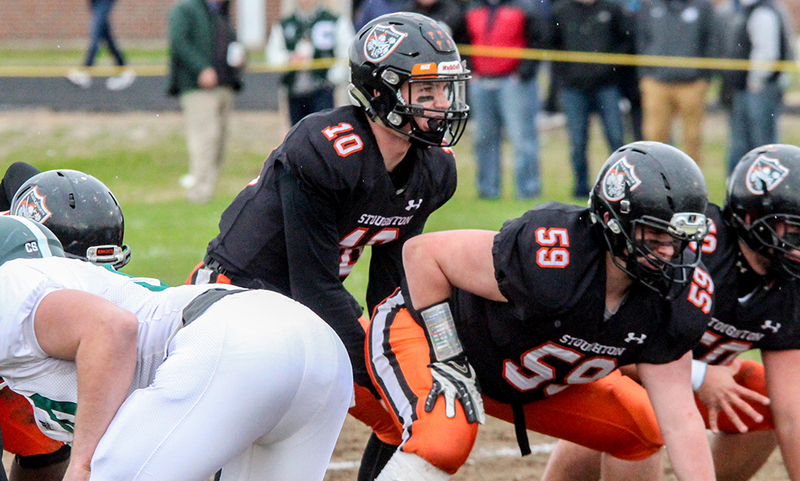 The Taunton offense flourished at times last season with Leonard connecting frequently with wideout Adam McLaughlin. Now that his favorite target has graduated, the junior signal caller will have to take advantage of the the other weapons at his disposal and there is plenty of confidence that he has control of the offense. He completed 90-of-158 passes in 2016, throwing for nearly 1,300 yards and 14 touchdowns. He also ran for two more scores. Head coach Brad Sidwell said that Taunton will run a lot more sets this year to diversify the offense and take advantage of Leonard’s skill set. With the quarterback position solidified, there is a lot of excitement about the Tigers’ potential. While a lot of the attention was focused on Blake Hill a year ago, Ryan O’Toole quietly put together a very impressive campaign out of the backfield. Despite not having a ton of varsity experience, O’Toole looked more like a veteran with his patience and ability to follow the block. Once the space opened up, O’Toole showed a great burst to get through it and get up field. He also impressed in one-on-one situations with the ability to get by defenders. He didn’t just line up in the backfield either. When the Hawks decided to spread it out, O’Toole often lined up in the slot and his speed made him a difficult cover for opposing defenses. He also returned punts for the team, making plays on special teams. 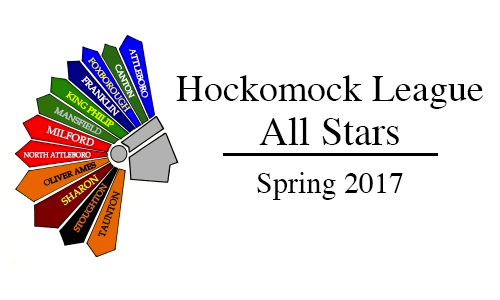 For the second straight season, Peterson set records for the Rocketeers and now he enters his third year as a starter with a full understanding of the North offense and the opportunity to win a third straight league title. He completed a program-record 110 completions last season (breaking the record he set as a sophomore) and threw for 1,700 yards and 23 touchdowns, which was also a single-season program record. Peterson also rushed for 144 yards and two touchdowns, showing off the athleticism to make plays either in the pocket or on the run. 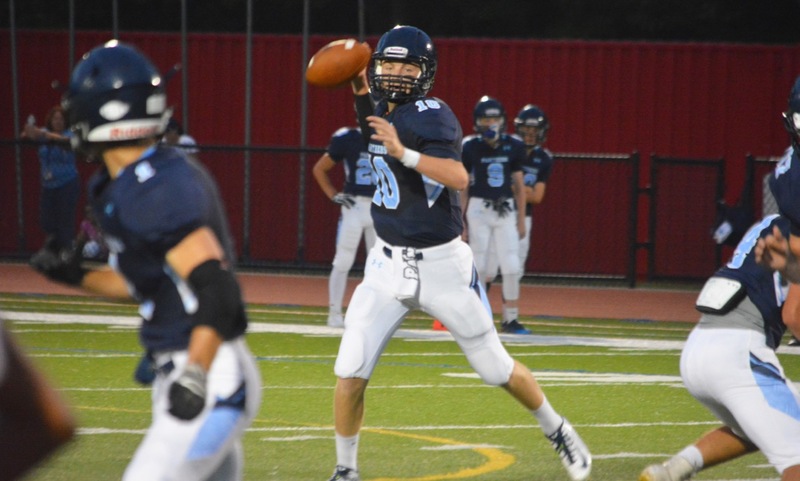 His versatility will be crucial for the North offense this year, as the Rocketeers go after a second title in two years in the Davenport division and three Hock title overall. In his first season as a starter for the Bombardiers, Sam showed consistent improvement from the beginning of the season to the final game and was one of Attleboro’s best playmakers either comping out of the backfield or split out wide. He led the team with 21 receptions for 483 yards and had seven of Attleboro’s nine touchdown receptions on the season. He also chipped in on special teams, setting up the Bombardiers with good field position. He is explosive off the line of scrimmage and can make even difficult catches in traffic look easy. With Sam on the outside, the Bombardiers have a weapon to stretch defenses and make plays downfield. His development is one of the reasons there is so much optimism for Attleboro this preseason.